Have no fear for the Jelly Belly DC Comics Superheroes are here! 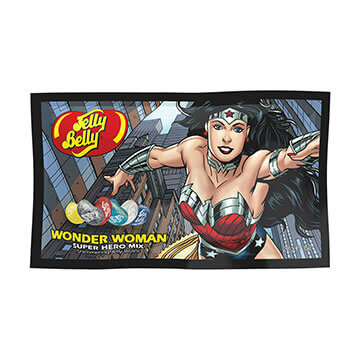 The new Jelly Belly DC Comics Superhero Mix’ is in store and online now so light your Bat-Signal, grab your Sword of Athena and put on your steel cape to get your hands on this delicious new Jelly Belly gift idea. These shimmering Jelly Belly beans come in 6 super flavours: Berry Blue, Blueberry, Cream Soda, Sour Lemon, Very Cherry and Wild Blackberry in every Jelly Belly DC Comics Superhero pack. 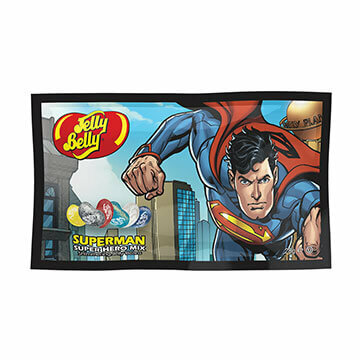 Your superhero weakness will be safe whilst snacking on these Jelly Belly tasty treats as they are: gluten free, peanut free, fat free and vegetarian friendly. 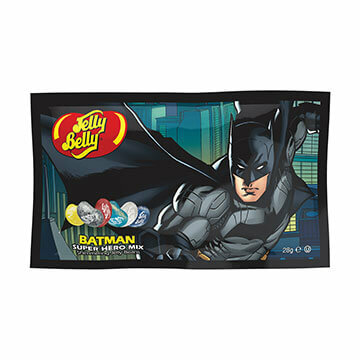 Be quick though before Lex Luther and The Joker get their cheeky hands on these delicious Jelly Belly and eat them all!